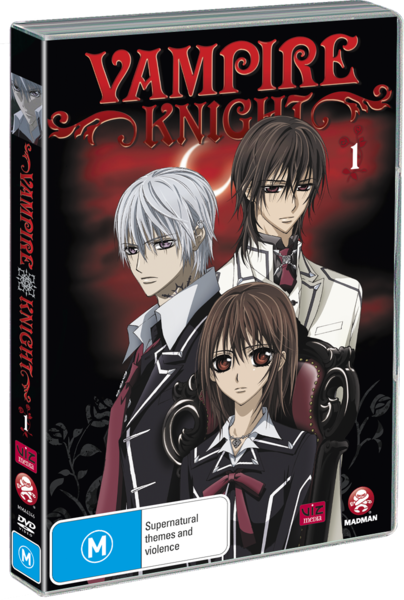 Vampire Knight is a series with a pretty cool twist that is the essence of the tale and what will keep viewers watching with somewhat baited breath. This premise is one that I have not seen executed before, and therefore it was the thrill of watching something fresh that kept me viewing from start to finish in the one sitting of this DVD. It's pretty simple. And involves vampires. As much as Hogwarts is a character unto itself in the Harry Potter series, so is the Cross Academy to the Vampire Knight saga. The Academy is also a place of learning but with two schools residing at the same building with very different students! There are the Night Classes and Day Classes and it is the responsibility of the Academy and it's guardians (who are also our main characters in this series) to make sure that the two schools do not come together. You see, it's pretty simple but the Day Classes are human girls who are all infatuated with the dashing VAMPIRE students of the Night Classes! I thought this was an awesome premise and it certainly makes for some suspenseful viewing as you wonder just what might happen if the Day students got caught up in some after hours activity with an entire school filled with potentially bloodthirsty vampires. The story opens up showing a young Yuki Cross, one of our previously mentioned guardians, as a child in the snow. In a sequence that impressed me, Yuki is about to be attacked by a vampire when in a flash she is actually saved by another vampire! It's a good scene and well animated. She is adopted by the headmaster of Cross Academy, Kaien Cross along with another child, Zero Kiryuu who unlike Yuki, has an abiding dislike and distrust for vampire due to his own personal background which is revealed in the later half of this DVD. The story carries nicely with a lot of twists and turns outside of the main premise to keep you interested. Both Yuki and Zero have great character development as the episodes progress, along with the story of the vampire Kaname who saved Yuki all those years ago. There is an uneasy relationship between the three that gets strained once a major plot point is revealed. I would be wrecking a nice reveal by telling you here but it's a doozy! The quality of the video in this series is champion with little to nothing to complain about. The style of the animation is gorgeous and perfectly suited to the story. I was really impressed. Audio was a 2.0 dolby affair in both English and Japanese and sounded great. There are no extras which is kind of a shame, however if the series is compiled at some point for a box set, I hope that there are some extras planned for that. This is a cool series and I was left wanting more when the last episode finally finished. I have no problems recommending this disc.